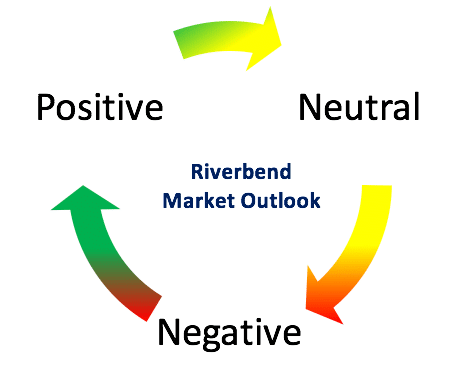 The Riverbend Conservative Growth Investment Strategy is based on statistical probability of historical market returns when compared to volatility and risk. 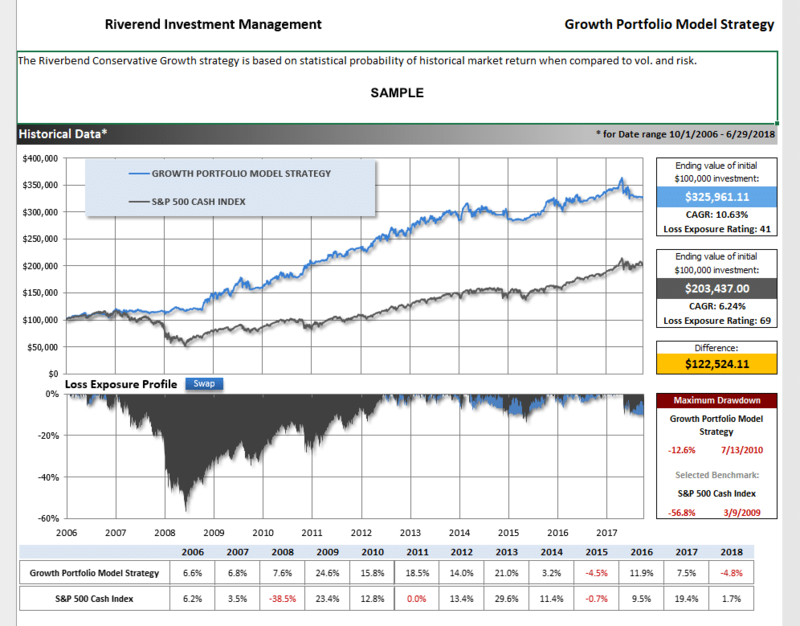 The strategy gauges the overall market outlook to determine what type of market cycle we are in, then invests the portfolio to match based on risk and volatility. The Market Condition for the investment strategy is determined by the number of (proprietary) timeframe indicators that are positive. When a positive reading is indicated, the portfolio is fully invested in sector and index ETFs and mutual funds chosen on relative strength readings. When a neutral and/or negative reading is indicated, the strategy invests in a bond and/or cash strategy. The bond portfolio members are selected from 18 wide-ranging bond sectors on the basis of our proprietary strength ratings. To Request A Factsheet with Historical Performance Information and more information on our separately managed accounts, Please Click Here. Targeted Risk metrics are generated from a backtested portfolio for the date range 10/1/2006 to 6/9/2018. Backtesting involves a hypothetical reconstruction, based on past market data, of what the performance of a particular account would have been had the adviser been managing the account using a particular investment strategy. Performance results presented do not represent actual trading using client assets but were achieved through the retroactive application of a model that was designed with the benefit of hindsight. Backtested performance results have inherent limitations, particularly the fact that these results do not represent actual trading and may not reflect the impact that material economic and market factors might have placed on the adviser’s decision-making if the adviser were actually managing the client’s money. These results should not be viewed as indicative of the adviser’s skill and do not reflect the performance results that were achieved by any particular client. During this period, the adviser was not providing advice using this model and clients’ results were materially different. The model that gave rise to these backtested performance results is one that the adviser is now using in managing clients’ accounts. Hypothetical performance returns are presented using Riverbend maximum annual fee of 2% net-of-fees (but do not account for fees that may be added by the custodian firm).